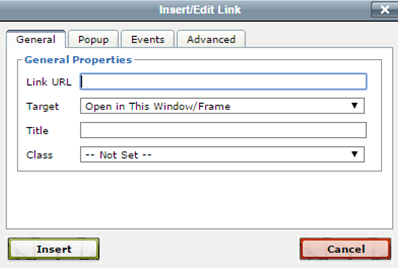 If you want to insert a link to an external website address, insert it in the Link URL field. (The easiest way to do this is to go to the page you want to link to and copy the link address displayed and then paste it into the Link URL field). There are numerous options that you can experiment with but one of the main ones to consider is the one underneath - Target. If you leave it as the default Open in This Window/Frame, the link will open in the current tab; that will mean that the person browsing it will move to a different website and, as a general rule, you don't want them to do that. If you select the Open in New Window (_blank) option, the link will open in a new tab. They will still leave your website but your site will still be open in a tab on their browser. NB this makes no difference for an email address. Return to Editing Content tutorial.